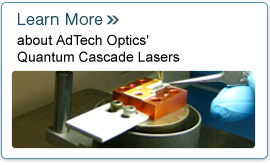 AdTech Optics designs, engineers, and manufactures mid-IR semiconductor lasers based on Quantum Cascade technology. Home to a respected team of dedicated engineers and scientists, AdTech has partnered with the world's leading academic institutions and has contributed to the scientific development of the emerging quantum cascade (QC) technology with numerous "firsts & bests" in laser design and manufacturing, setting unprecedented performance milestones. 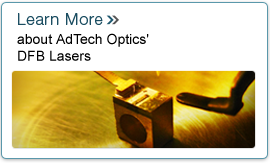 AdTech Optics has committed substantial resources to furthering the science and engineering of QC lasers, and is a widely respected member of the NSF collaboration on Mid-InfraRed Technologies for Health and Environment - MIRTHE. Our team is shaping the industry standards, and is continually engaging in Research & Development in a fast-paced environment rich of intellectual resources, innovative technology solutions, and state-of-the-art equipment. AdTech Optics will be attending SPIE Photonics West 2018 in San Francisco, CA, in February. Booth No: 4204. AdTech Optics will be attending SPIE Photonics West 2017 in San Francisco, CA, in February. Booth No: 4225. FINALIST of the 2013 Prism Awards competition with the product "QCL-DFB 783".